One of my favorite movie scenes is in the film Parenthood, when the elderly grandmother compares life to a roller coaster, with some people enjoying the exhilaration of the ride and others fearful of the surprises and unexpected turns. Well, if that analogy is true, we have been in the corkscrew turns for the last couple of months. Life has given us fun surprises, great adventures and some challenges, too. Do you have weeks where you think, “Okay, this week was crazy, but NEXT week will be normal.”? Because it’s the new normal? That’s where we are right now. How to survive these complicated, extra busy times? Like a great yoga class, flexibility and balance are the keys. Flexibility to meet each new challenge and see it as an opportunity for personal growth and balance to keep what is most important at your core. I’m good with the flexibility, but working on the balance. It’s easy to get knocked off kilter by issues that seem important, but are actually just distractions. So here we are, riding the roller coaster, hands up in the air, a little scared, but also excited. Our nutrition has fallen off the wagon a bit in the process, but we are making a committed effort to get back on track and keep a balanced weekly menu. It helps that all our regional farmer’s markets are opening this month, and farmers are bringing in more of a variety of fresh fruits and vegetables. And we will need all that good nutrition, because we have decided to go Goofy. Not only are Tom and I training for a local marathon in the fall, but we will return to Disney World in January to run the Goofy Challenge. Two races in two days–a half marathon and a marathon. Two races, three medals, and a big ol’ check mark next to a bucket list item. Oh, and lots of fun. And costumes! In the meantime, we have a lot of training to do and that will require a lot of healthy fueling. This recipe is awesome, easy, and it takes advantage of fresh, local cabbage. Roasting vegetables is simple and requires very few ingredients. It also takes advantage of all the wonderful sweetness in fresh vegetables. 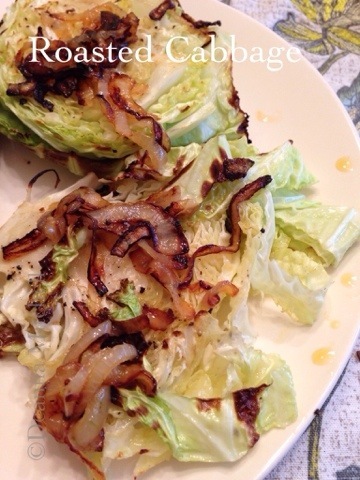 I saw this idea for oven roasted cabbage on Pinterest and gave it a try. You could serve this dish as a vegan entree or pair it with protein (we chose locally made kielbassa). We also added some caramelized onions to the roasted cabbage, which I think really amped up the flavor! Slice the cabbage head into 1 1/2″ steaks. Place the “steaks” on a lightly greased baking sheet. Brush both sides of the cabbage with olive oil and sprinkle with salt, pepper and garlic powder. Roast for 20 minutes, flip and continue roasting for another 15-20 minutes or until the cabbage is soft and slightly charred on the edges. While the cabbage is roasting, saute the onion in about 1 tablespoon or so of olive oil. Saute until brown and caramelized, about 20 minutes. Remove cabbage from the baking sheet and put on plates. Top with onions. This can be served as a side dish or as an entrée! Enjoy and stay on that roller coaster! You can eat like royalty and travel the world. Really. Eat your carrots. 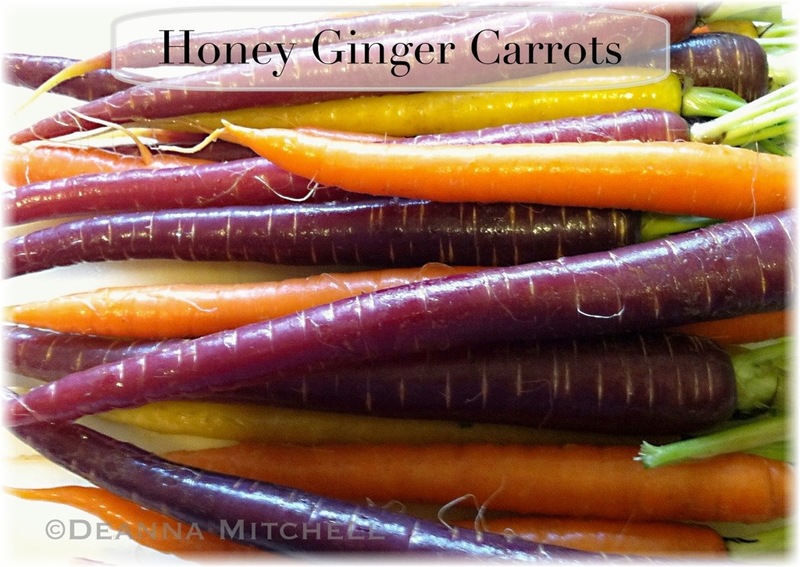 Once upon a time, carrots came in a range of beautiful colors and a great range of sizes. Tasty, crunchy and beautiful, carrots were prized for their crisp, fresh flavor and unusual colors. Yellow carrots like the ones above were first recorded in Turkey as far back as the 1st century. Purple carrots have been documented in the Middle East since 900 B.C. and were bred for Dutch royalty through the 1500s. White carrots were a staple in Europe and are the only carrot to originate in Europe. Who needs bad airplane food and the TSA when you can travel around the world by eating carrots? So why do we find mostly orange carrots? Orange carrots are a Dutch hybrid of white, yellow and wild carrots. At some point, our market-based food industry decided we needed carrots that were consistent in size and shape as well as easy to ship. Hybrid orange carrots were developed to meet this need and voila! We have orange carrots. At some later bizarre point in history, food manufacturers realized they could shave down perfectly good carrots into nubs and call them baby carrots, although they are not baby at all. We are so weird. For more carrot information, you can go the the Carrot Museum webpage (seriously). I’m glad some of our farmers and groceries have started investing in colorful, flavorful heirloom varieties of carrots. Only a few of our organic farmer’s market vendors sell these, and they usually sell out pretty quickly, so I’m hoping more of our farmers will join in and plant these lovely varieties. Old variety carrots tend to be thinner and more fragile than their grocery store cousins, but they pack great flavor and are lovely on a plate. This recipe pairs carrots with two of their flavor bffs–fresh ginger and raw honey. 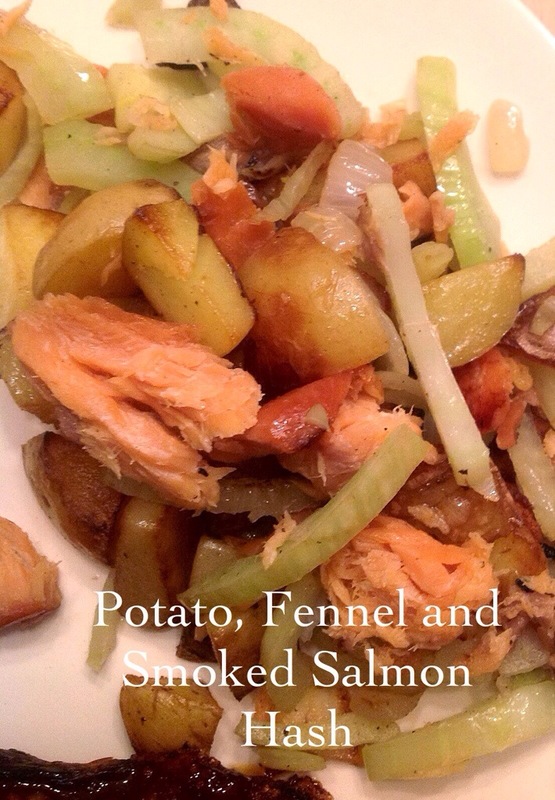 This is an easy recipe and experimental, so I’d love to hear your thoughts. Honey and thyme would probably make a good combination as well. You can use any carrots–they don’t have to be heirloom or fancy varieties. But because carrots are root vegetables, I do try to buy organic whenever possible (many pesticide-treated root vegetables are also treated with bud inhibitors to keep them from sprouting). Get your spring carrot fix, travel the world and boost your health as well! Preheat oven to 400 degrees and line a rimmed baking sheet with foil. Wash and peel the carrots. Trim the tops. Cut the carrots in half lengthwise and then cut the halves into 2″-3″ pieces. Put cut pieces into a medium bowl. Toss carrots with 2 tablespoons olive oil, salt and pepper. Pour carrots onto baking sheet and roast for 30-40 minutes (check on them often to make sure they don’t char). In a sauté pan, add remaining 2 tablespoons olive oil and heat at medium. Add ginger and stir. Cook 1 minute. Remove the carrots from the oven and add to the pan. Toss well. Add honey and toss all together until carrots are coated with honey glaze. Check for seasoning and correct if needed. Serve immediately. This past holiday season, all the good dogs in our lives received homemade dog biscuits! These were fun and easy to make and the dogs seemed to like them very much. We made several batches for less money than we could purchase high end, organic dog treats. We thought perhaps our cat would like them too, but he prefers our spiced sweet potato biscuits to the dog treats–go figure! This recipe came from Giada de Laurentiis’s weekly newsletter Giada, and it makes about a dozen large treats or two dozen smaller treats. 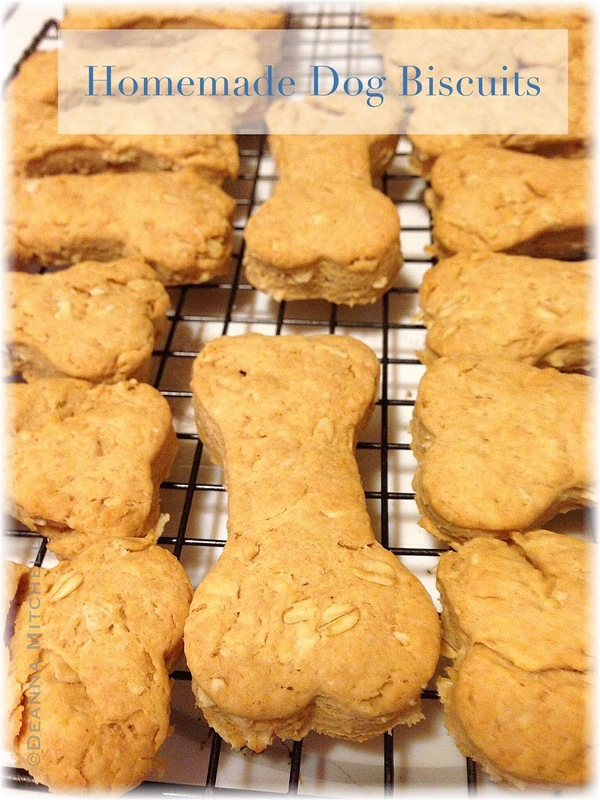 I used a dog bone shaped cookie cutter, but you could make these in any shape you want–I’m pretty sure your dog won’t mind 🙂 The recipe below includes cheese, but I don’t use cheese in our biscuits. Dairy and dogs is not always a good combination and Jessie doesn’t seem to notice anything is missing, so we just leave that out. Combine the flour, oats and baking powder in a large bowl. Stir in the peanut butter and broth until the mixture forms a dough. Press the dough to form a ball. Lightly flour a counter or work surface. Knead the dough for about 30 seconds. Roll the dough into a 10″ circle, about 1/2 ” thick. Us the cookie cutter to cut out the biscuits and put biscuits on the lined baking sheet, about 1″ apart. Keep re-rolling the dough and cutting out biscuits until you run out of dough. Sprinkle the biscuits with cheese, if using, and bake for 25 minutes, until golden in color. Cool completely and store in an airtight container in the refrigerator for up to a week or freeze for up to 3 months. You over there. Yes, you, the one on your way to the gym to fulfill your New Year’s resolution. Put down the neon colored “sports drink”. You heard me. Put it down! The ubiquitous “sports drink” phenomenon is baffling to me. I’m not sure at what point it became a requirement for anyone who sweats to drink a neon-colored electrolyte replacement. Look at any youth soccer/basketball/softball game. Parents are hauling in cases of Gatorade instead of water. Say what??? Let’s take a time out here. Here is a fact about exercise and hydration: most of the time that most of us exercise, we are not exerting ourselves to the point of needing electrolyte replacement. Everyone is different, of course, and longer workouts where you are really pushing yourself are great candidates for electrolytes. Typically, though, the majority of us do not sweat so much in a 30 minute weight room session (or even a 60 minute Zumba class) that we need electrolytes, especially when they are combined with chemicals, neon colored dye and sugar. No matter what the commercials say. Healthy hydration actually starts BEFORE you exercise, and it can make a big difference. If you have a big work out coming up or if you know, for example, you will be skiing all day, drink plenty of water in the day or so before and you will see the benefits. I’ve had to learn this the hard way–trust me, your body will thank you for starting out hydrated! Water is always good for you. Always. Making your own sports drink is easy, cheap and healthy. Typically, we drink water on our runs under 10 miles. Anything over 10 miles and I bring one little water bottle and one little bottle of this awesome electrolyte replacement. It tastes better than packaged sports drinks, is very refreshing and uses all natural ingredients. It isn’t fancy, it isn’t brightly colored and it isn’t endorsed by athlete celebrities. But it is very good. If you eliminate the salt and honey, this recipe would make a great flavored water drink for a hot day, for a post soccer game drink or a day when you are just sick of drinking water, but don’t need the extra sodium. So stay hydrated–even in cold weather–and enjoy those winter workouts! But steer clear of the junk–treat your body like the wonderful machine it is! Put water, juice from the oranges and lemons, honey and salt in a blender. Chill and drink as needed. NOTE: You can replace the orange with another citrus fruit or even tart cherry juice. What do you do when it’s cold and rainy and your CSA delivers 5 pounds of fresh carrots? Make carrot soup! This soup is very easy to make and has only a few ingredients. The coconut cream gives a rich flavor and mellows out the curry without tasting too coconutty. Fresh carrots have a wonderful, sweet flavor that their grocery store cousins often lack, so if you have access to fresh dug carrots, I would use them here! Also, if you are not a fan of curry, you could substitute fresh ginger for the curry and have an equally delightful soup! 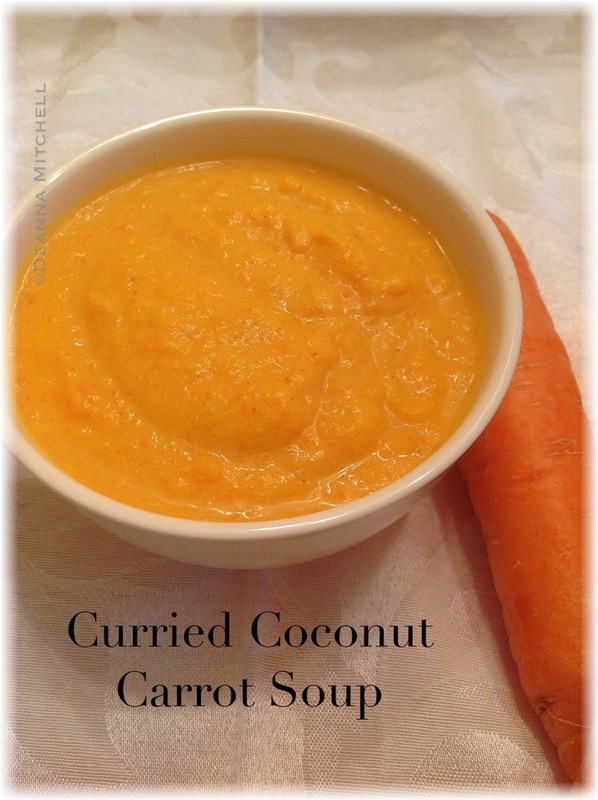 This soup freezes well, so while it makes a lot, you don’t have to eat it all right away! Scrub, peel and chop all the carrots into 1″ pieces. Set aside. In a stock pot or large Dutch oven, heat the coconut oil over medium low heat. Add chopped onions and sauté until very soft and transparent (about 3 minutes). Add the garlic and cook 1 minute. Add all the remaining ingredients to the pot, cover and simmer over medium low or low heat for about 1 hour. Stir frequently. When carrots are very soft, use an immersion blender (CAREFULLY as soup is hot) to blend all the ingredients to a smooth consistency. Add a bit of water if the soup is too thick or cook a bit longer if you want a thicker soup. Taste for seasoning and correct if needed. This is one of my favorite holiday recipes. We had these biscuits again this Thanksgiving, and they are marvelous! The recipe comes from Monticello, home of Thomas Jefferson, where I was lucky enough to intern in graduate school. I’ve altered the recipe a bit, replacing lard with butter (you’re welcome) and increasing the spices. 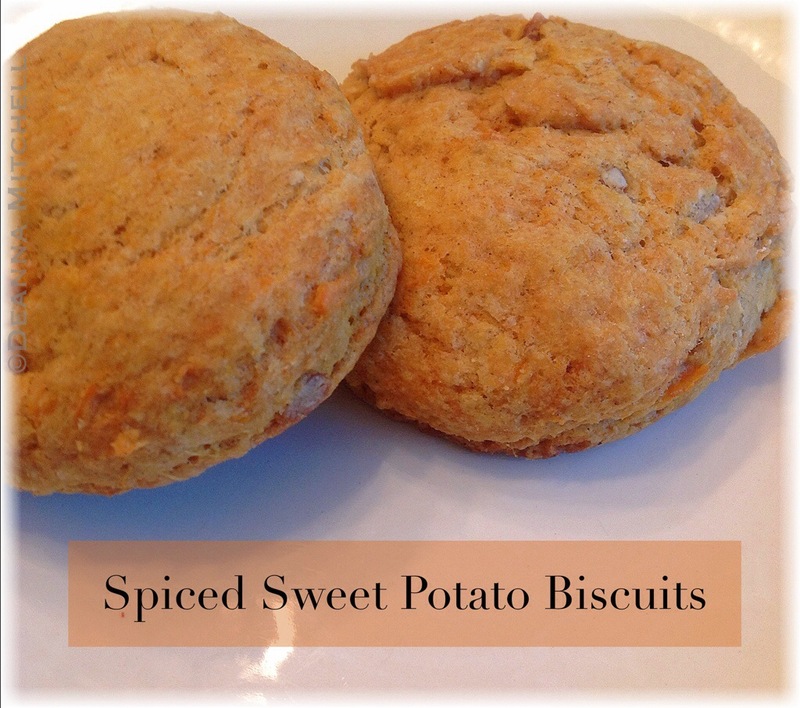 They are sweet, spicy and moist, with enough flakiness that they are a true biscuit and not a roll. Great with ham or with soup! This recipe makes a LOT of biscuits. If you don’t want quite that many, you can freeze the uncooked biscuits for later and just pop them onto a baking sheet and bake for 20-25 minutes at 400 degrees. Or you can just halve the recipe! 1. Preheat oven to 450 degrees. 2. In a large mixing bowl, stir together flour, brown sugar, baking powder, cinnamon, salt, ginger and allspice. Combine well. 3. Cut in the butter with two knives or with your fingers, until crumbly. 4. In a separate bowl, combine the sweet potato, cream and pecans. 5. Make a well in the center of the dry ingredients and add the potato mixture. Stir with a wooden spoon to combine. 6. Turn dough onto a lightly floured surface and roll or pat dough to about 2″ thick. 7. Cut biscuits with a 2″ cutter and place biscuits about 1″ apart on an ungreased baking sheet. 8. Bake for 10-15 minutes until golden brown. 9. Serve warm to happy guests! Most of the time, I leave sacred holiday food alone. I mean, why mess around with something you know is good? My family loves deviled eggs and they are mostly purists–nothing fancy, nothing crazy. 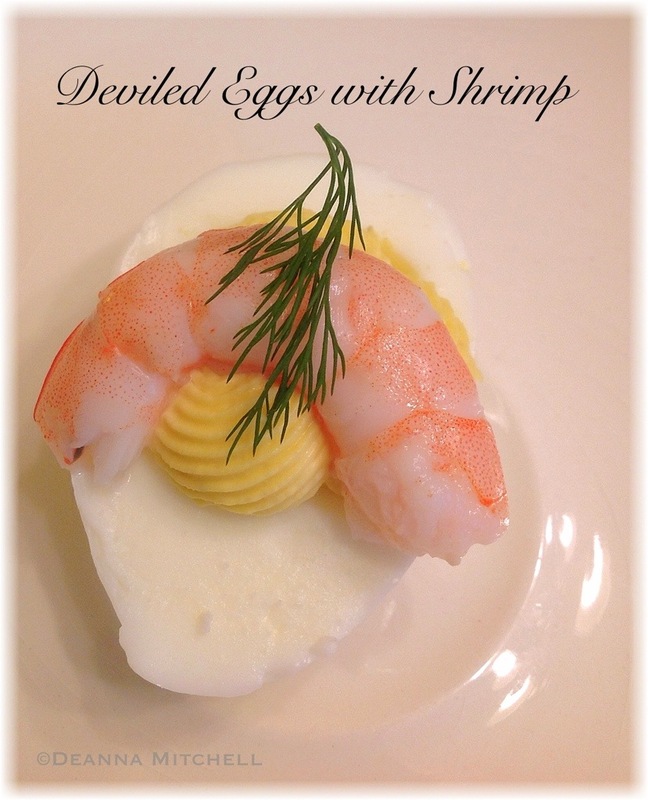 But this year, I tempted fate by offering a variation on our usual deviled eggs featuring fresh, locally caught shrimp. We purchased the shrimp from Locals Seafood, a terrific, local company that brings us fresh, North Carolina seafood several times a week. The result was very tasty and beautiful! A note about the shrimp shells. Use the opportunity to make some homemade seafood stock! Get double benefit from poaching the shrimp by reserving the poaching liquid, adding back in enough water to make a quart of liquid (or so–you don’t have to be exact). Add the shrimp shells, two stalks of celery , peppercorns and 1/2 onion. Simmer for 45 minutes, strain and let cool. Freeze for up to 6 months. Put the shrimp, one sprig of dill and the lemon in a saucepan and cover with water. Heat shrimp over medium high until shrimp is pink and opaque. Do not overcook. Drain shrimp, let cool and remove the shells (save the shells for making seafood stock!). Leave shrimp in the refrigerator until you are ready for them. Put the eggs in the saucepan and cover with water. Bring water to a boil, then cover, turn off the heat and let the pot sit for 15 minutes. Drain the eggs and run under cold water to stop the cooking process. Leave the eggs in the refrigerator for 15 minutes or so. Peel the eggs. Cut each egg in half lengthwise and pop the yolks into a medium mixing bowl. Move the empty whites to a serving platter. Mash the yolks with a fork. Mix with mayonnaise, salt and pepper until smooth. Add more mayonnaise if needed. Scoop the egg yolk mixture into the egg white shells or use a piping bag, if you want to be fancy. Just prior to serving, top each deviled egg with one poached shrimp and a small piece of dill. You know the song, right? 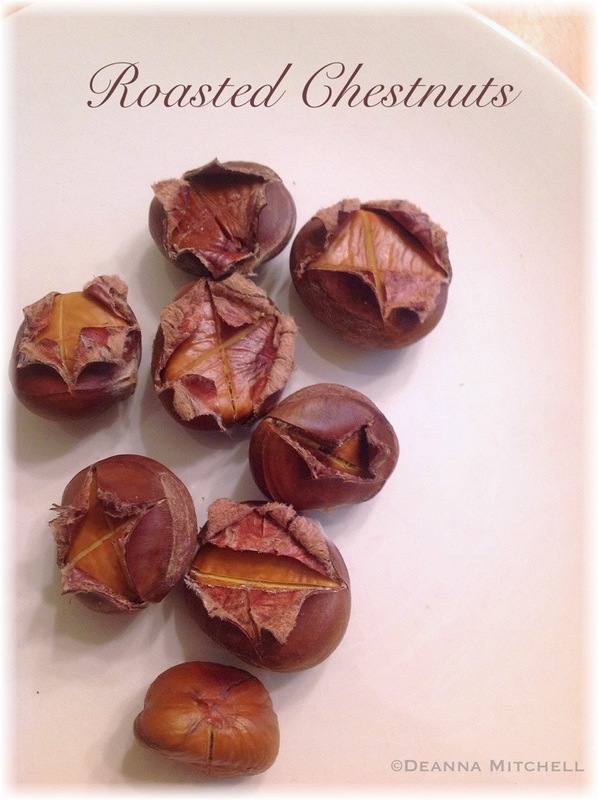 It’s called “The Christmas Song,” but most of us know it as “Chestnuts Roasting on an Open Fire.” I have heard that song all my life, but I had never eaten a chestnut. I figured they were like walnuts or something, and couldn’t figure out how in the world a nut got an entire Christmas song to itself. I mean, I get peppermint having a song, or even gingerbread. But chestnuts? Clearly, some political move from the chestnut lobby. So when our Produce Box arrived last week with a bag of chestnuts from a local farm, I thought it would be a good time to see what all the hype was about. I decided to make a chestnut sausage stuffing for Thanksgiving and to prep the chestnuts, I would roast them not over an open fire (torrential rain here), but in the oven. I was a bit intimidated by the whole “cut an x in the nut shell or it will explode” business, but it all turned out well. I have a little serrated paring knife that worked very well at cutting through the shell, and nothing exploded inside my oven (which is good because calling a repair person the week of Thanksgiving is a good way to end up with a dinner of grilled cheese). I let the roasted nuts cool for 10 minutes before peeling them and that was ample time. The nut shells came off quite easily and were tossed into the compost bin. I tasted one of the warm nuts, and couldn’t believe how meaty it tasted. Wow! I tried another one in case the first was some kind of abberation. Delicious! It took a great deal of self-control not to eat all of them and adjust my stuffing recipe to suit pecans. In fact, the next time I see them offered by The Produce Box, I am going to order more. Talk about great football snacks! With a sharp paring knife, score an “x” on the flat side of the nut, cutting through the shell. 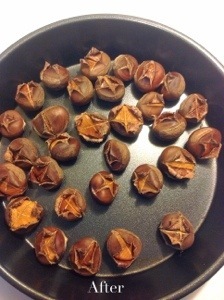 Put the nuts, cut side up, in a roasting pan or other shallow, oven-safe pan. 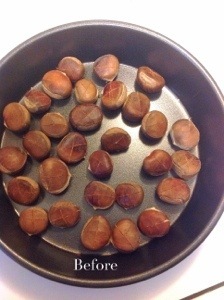 Roast the chestnuts for 20-30 minutes. Remove from the oven and let nuts cool for about 10 minutes. Peel the shells from the nut meat and discard the shells. Use the nuts immediately or refrigerate for up to three days. I love cranberries, and Thanksgiving just wouldn’t be the same without homemade cranberry sauce. It is so easy to make, and can be prepared ahead and parked in the refrigerator for several days. Usually, I make a cranberry-orange sauce. 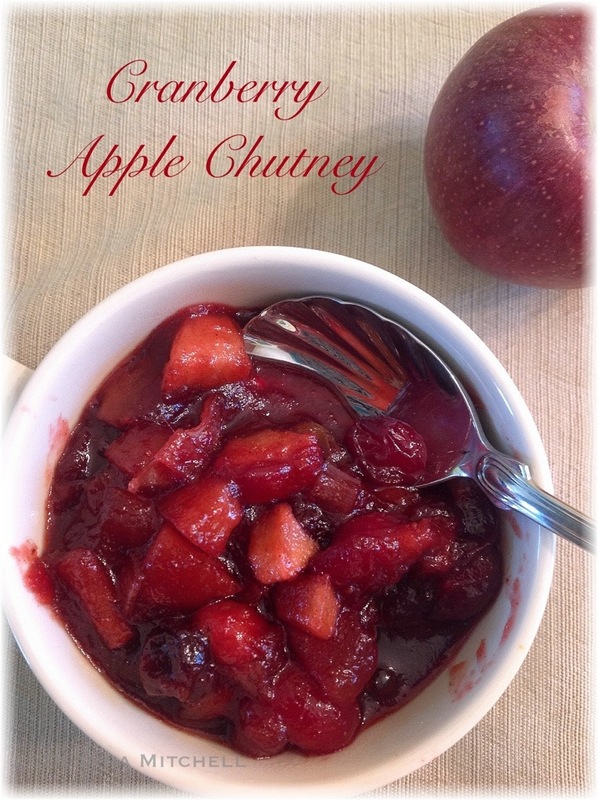 And usually, I remember to take it out of the refrigerator before dessert 🙂 This year, we changed things up just a bit, using some of the local apples we received in our Produce Box to make a spicy chutney instead. This chutney is sweet,savory and spicy all at the same time. It will pair well with turkey, but I’m betting it will also really rock a pork loin roast (note to self: get a pork loin roast!). I think it will also be fabulous on a turkey burger or on a sandwich. Endless possibilities! Heat the cane sugar and water in a large saucepan to boiling. Reduce heat and simmer for 3 minutes. Add all other ingredients except the nuts, stir well and return to a boil. Reduce heat to medium low and simmer the sauce for about 25 minutes, stirring frequently. Sauce should be thick and jammy when done. Add the chopped pecans and serve warm or cold. You can store in the refrigerator for up to 4 days or freeze for up to 3 months.